Petteri Walldén - Nokian Tyres was awarded at a reception in Hotel Kämp 18th January 2012. 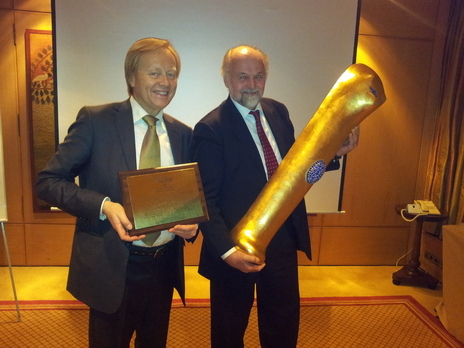 Chair of the Year 2011 Petteri Walldén (to the right)has shown strategic wisdom by establishing a factory in Russia producing from 2010 and by starting building a second factory ready in 2012. The Russian market has been less affected of the European financial crisis and has shown strong growth in 2011, total sales +41% in 2011. The board and administration have shown strong leadership through the crisis in Europe by adjusting costs in 2009 and 2010. The estimate for 2011 is 100% profit increase up to € 261 mill for the first 9 months, a margin of 26,8% that many producers dream of. The Russian investment agreement will prolong the tax benefits and incentives for 9 years. Petteri Walldén (63) has long and broad board experience from 7 other companies. The largest companies are Kuusakoski Group Oy Sales €544 mill and Tikkurila Oy where he is Vice Chairman.Sales €550 mill. The results in Nokian Tyres during Petteri’s chairmanship speak very strongly. The company has years been the most profitable tyre company in the world. Both the strategic direction and choices as well as operational execution and responsiveness to changing market needs have been done in an excellent way. The chair has played a central role in creating good ground for innovative strategy and constantly increasing shareholder value. He is certainly dedicated, efficiently moderating the sessions, and managing to generate fruitful discussions. He manages extremely well the board with representative of competitor, different nationalities and very strong CEO – the company is excellent in balancing risk while operating in high risk countries. The board has always the final say in important decisions. The chairman is very competent when leading discussions during the board meetings. The chairman gains great respect for his personal integrity and he is mature and has authority. Board compensation: 60% of the annual fee is paid in cash and 40% in company shares. We think that many other companies should follow this strategy. The board members should own shares to feel the shareowners shifting happiness and grief. Tikkurila Oy €550 mill(Vice Chairman) and Mesera Oy € 11 mill. Nokian Tyres is the only tyre manufacturer in the world that focuses on customer needs in northern conditions. The company supplies innovative tyres for cars, trucks and special heavy machinery mainly in areas with special challenges for tyre performance: snow, forests and harsh driving conditions in different seasons. Nokian Tyres’ product development is consistently aiming for sustainable solutions for safety and the environment, taking into account the whole life cycle of the tyre. In 2010, Nokian Tyres had 3,506 employees and net sales of EUR 1.058 billion. Nokian Tyres’ shares are listed on the NASDAQ OMX Helsinki. The products are mainly sold in replacement markets. The group has own sales companies in Sweden, Norway, Germany, Switzerland, Russia, Ukraine, Kazakhstan, Czech Republic, USA and Belarus. In other countries sales is implemented by importers on a limited or one-brand approach. A member of Nokian Tyres group, tyre chain Vianor operates as a wholesaler and a retailer in Nokian Tyres’ core markets. Other distributors have longterm partnerships and are loyal in building Nokian brand positioning on their markets. Important customer groups are also the endusers of tyres and the Original Equipment manufacturers that are involved in longterm product development co-operation with Nokian Tyres. Interactive and transparent processes designed to serve the customers and end users, especially during the peak season: seasonal management systems, 24-hour deliveries, complete tyre/rim combinations for car dealers and tyre hotels. Key products are produced in own factories in Nokia, Finland and in Vsevolozhsk, Russia. Certain products are produced by off-take contract manufacturers in factories where the quality level corresponds to Nokian Tyres’ high standards. Earth work for the new plant and warehouse next to the current ones in Russia has started. The new plant is estimated to commence production with two additional production lines during 2012 and further capacity increase by two lines taking place during 2013-2014. 5-6 million tyres – yearly production in 2011 11 million tyres. Nokian Tyres group’s net sales increased by 41.3 % to EUR 974.3 million (EUR 689.4 million in 1-9/2010). Operating profit grew to EUR 261.0 million (EUR 130.4 million) +100% and Earnings per share increased to EUR 1.66 (EUR 0.85). Car tyre deliveries have increased clearly and demand remains strong for all 2011 on Nokian Tyres’ core markets, despite uncertainties in the global economy. Low inventories in distribution combined with improved car sales and a clear growth in winter tyre sales in Europe and Russia/CIS offer further growth potential. Heavy tyre demand is healthy for 2011 but the growth in order intake is levelling off. Drivers for growth in Nokian Tyres’ core markets are still intact. Annual GDP growth averaged approximately 4% in both the Nordic countries and in Russia at the end of the review period. The new car sales increased in the Nordic countries by approximately 11% year-over-year. In Russia the new car sales were up by 44% in January-September compared to the corresponding period in 2010. Sales of new cars in Russia are expected to continue to grow with an estimated total growth of 30% in 2011 year-over-year. The prices for natural rubber and oil-based materials rose significantly from early 2009 to mid-2011 and some materials were in short supply. In early 2011 raw material costs continued to go up triggering additional price increases from the tyre industry. At the end of the review period raw material prices have dropped and availability is back to normal. The tyre industry raw material costs have still risen slightly in Q3/2011 due to stocks purchased with higher prices. The industry has continued to implement price increases, although at a slower pace. Tyre industry pricing discipline appears to be good. The Group’s tax rate in 2010 was 18.7%. It is estimated to be slightly below that in 2011.The tax rate is effected by tax relieves in Russia based on present investments and further investment-related incentive agreements. A new agreement has been completed with authorities in Russia concerning additional investment in the existing factory and building the new factory. The agreement will prolong the tax benefits and incentives for 9 years. In 2011, the company is positioned to provide strong sales growth and to improve operating profit significantly compared to 2010. The award is a brass plate and a sculpture of international artist Marian Heyerdahl which the company has for one year before it is passed on to the new winner. It symbolizes a long life for the company when it brings new ideas to the market symbolized by an egg mosaic. Director General Petri Peltonen is Head of the Innovation Department at the Ministry of Employment and the Economy, a new ministry created in the beginning of 2008 in a major restructuring of the Finnish central government. Dr Leenamaija Otala, Adjunct professor, is working as senior lecturer, researcher, writer and speaker in the areas of leadership, board work, competence and learning. She has worked for 30 years in the interface of academia and business and tried to transfer scientific knowledge into practical business. She is also owner of Pro Competence Inc., which has carried out numerous board assessments. 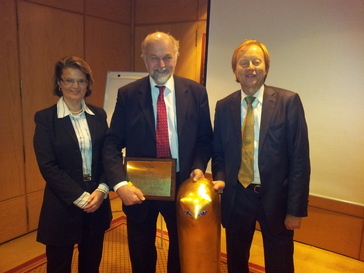 Gunnar Eckbo chair of the juries in all Nordic countries. 2009: Risto Siilasmaa, F-Secure Oyj. Gunnar Eckbo (58) CEO, board analyst since 2000 when he founded a web newspaper about board work and the composition of boards. He has a Master of Science in Business at BI Norwegian Business School and working experience within boards and marketing research for 30 years. In each Nordic country Mr. Eckbo has recruited jury members that have experience in board work and know the local business community. Vi er synlige på sosiale medier. Ta kontakt med oss i dag.